Just south of the Mount Edgecombe Country Club Estates and close to the Gateway Shopping Centre, Kindlewood Estate currently consists of 229 completed homes with the potential for 700 residential units when fully built. Home to a discerning market sector, the estate is characterised not only by its tranquil ambience, but also by its guarantee of secure living. Established in 2008, the estate’s security initially focused on analogue cameras at the gate houses with access gained using remote control dongles, then security discs and finally access cards. As the estate was built in phases, so the perimeter security grew to accommodate the growing footprint. Phase 4 has now been completed and Phase 5 will be released to the market in the near future. 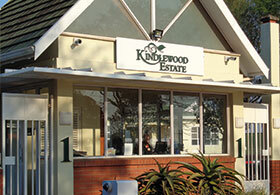 “Naturally, there comes a point where not only the expansion in the size of the estate, but moreover changing technology dictate that the overall security system will require a revamp or upgrade,” says Kindlewood estate manager Jon Dreyer. Consultation with the estate’s existing security consultants Excellerate, as well as with Rob Anderson from Adamastor ensured that all risk areas were prioritised and in 2012 the board and management implemented an 11-step programme to enable the enhancement of the security system. This programme addressed access control, a control room upgrade, new perimeter cameras and the replacement of all existing analogue cameras at the gatehouses with IP cameras. The upgrade of the control room is taking place concurrently and will ensure that the controllers are comfortable and productive. Together with the substantial increase in the quality of the images captured and recorded, Dreyer believes that once the whole upgrade is complete there will not be any area on the estate’s perimeter which is not monitored by camera. A knock-on benefit is that the estate will be able to reduce its monthly security guarding expense. 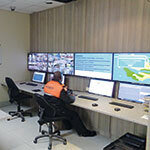 The access control system is being enhanced through the addition of biometric readers. However, due to the fact that the Mount Edgecombe Retirement Village is being constructed within the estate, due consideration had to be given to the common degradation of the fingerprints of these retirees. The decision was therefore taken to run the new biometric system alongside the existing card reader system for ingress and egress purposes. A further access control element which was added by the estate is an automated system whereby reference numbers are generated by residents to allow their visitors to access the estate. This is a marked improvement on the current system which entails the security guard entering the code provided by the visitor into the system. “The new app will generate the current alphanumerical code and two variations of a digital barcode. The visitor then scans the barcode from their mobile phone by using a specific barcode reader and this will then initiate the number plate reader (NPR) to automatically record the visitor’s vehicle licence plate. The security guard’s only involvement is the recording of the number of visitors in the vehicle, thereby saving time and reducing bottlenecks at the entry points,” says Dreyer. Excellerate and Adamastor are currently addressing the fibre requirements for the estate’s perimeter fence with installation expected to be completed by the end of 2018. Dreyer says that when funds become available, the estate will add further IP cameras to complete the project.